Maybe you’re a fairly new street rider or maybe you’ve been riding for some time. Perhaps you took the Motorcycle Safety Foundation Beginner’s Rider’s Course and even the Experienced Rider’s Course once or twice to help keep those skills updated. You’ve also read every book you can find on riding skills, but you’re feeling a little stale, like you’ve hit some sort of “plateau”. Possibly you’re looking for a way to hone those skills, interested in “raising the bar”, checking out those track days you’ve heard about or maybe even have dreams of racing. Whatever the reason, I highly recommend attending one of the high performance motorcycle riding schools. You can test and improve your skills while having an experienced, skilled coach help you in an environment free of distractions such as cars, trucks, animals, surface hazards, or even the police. I started looking into this type of class about three years ago. As a 50-something adult I have no illusions about becoming a racer; my reasons were to become a better rider and that only comes with practice and proper training…but I’ll admit the idea of riding on a race track at higher than legal speeds was definitely an attraction! So I went to every website, reviewed their programs, the locations and the pricing. I watched for reviews of the schools in magazines. I also took into consideration the refund policies of the various schools. Prices did vary and some schools were a little cheaper but would have required additional travel expenses. This had to be figured into the overall cost, so final costs were competitive. After analyzing the choices, I chose to go with the California Superbike School when they came to the Virginia International Raceway (VIR). 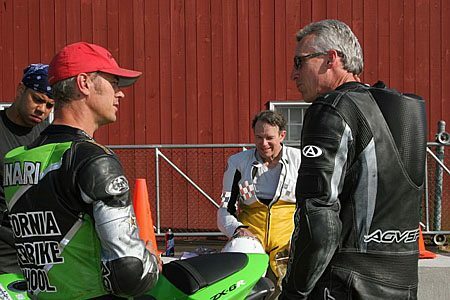 Why the California Superbike School? For starters, location. California Superbike School travels to some of the finest tracks all over the U.S. (they’re also worldwide), one of which is probably within a days’ drive of where you live. They were also the first high performance school in the U.S., starting back in 1980, and have trained more riders than anyone else in the world. I also chose the California Superbike School because they have some unusual bikes built as training aids, such as their “lean bike”, the “brake bike”, the “slide bike”, a “camera bike” and, of course, the “no BS (Body Steer) bike”. As it turned out, I had to cancel three weeks before the class started so the California Superbike School refund policy became an important point for me. California Superbike School was the only school that provided a full refund, provided it was done at least 14 days before the class started. From that date onwards, it pro-rates over time, down to a point of no refund at all. This, I feel, is better than a credit towards another class that has to be taken within a specific time period. Three years later, I again signed up to attend their two-day camp at VIR. 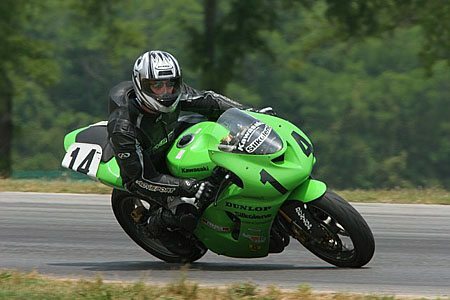 Many of the performance motorcycle training schools are headed by and often carry the name of a famous past racer. While Keith Code, who is the mastermind behind California Superbike School, may not have achieved the title of World Champion, he has trained many riders that have become champions, such as Eric Bostrom, Doug Chandler, Tommy Hayden and James Toseland, just to name a few. California Superbike School has one-day classes for all levels. There are also two-day “camps” which include all of the “bells and whistles” such as breakfast, lunch, all of the riding gear ( including full race leathers), bike use, lap times and the special training bikes (available at most locations). I chose to go with the two-day camp. I don’t own a set of race leathers or even an appropriate bike for the class, as my BMW-K1200LT doesn’t quite cut it as a sport bike! Essentially all I had to do was show up on time and in good health. California Superbike School has teamed up with “Team Green” and provides Kawasaki ZX-6R 636’s in full race green colors which proved to be a blast to ride. Note also that students are allowed to ride their own bike, even if it’s not a Kawasaki. Their gear is also available for rent should you have the bike but not the gear. 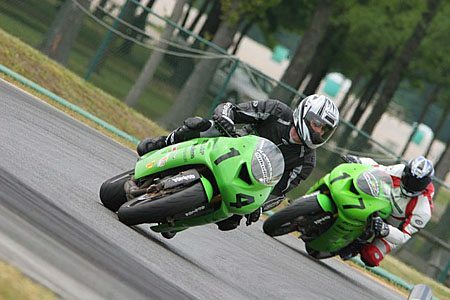 California Superbike School’s motto is “Discover The Art Of Cornering”. 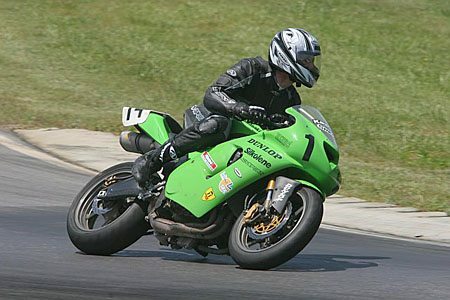 Keith Code has written several books such as “A Twist Of The Wrist 1”, “A Twist Of The Wrist 2” and “The Soft Science Of Road Racing Motorcycles”, and cornering is the main topic of each (see below for a listing of many webBikeWorld reviews of motorcycle riding skills books). Cornering is the focus of the school — working on overcoming fear and panic to perfect the cornering process. This is done by breaking cornering down into a series of steps. Each step is first explained and discussed in the classroom and then practiced out on the track. Each step builds on the one before. Our first day started promptly at 7am on a beautiful day in May. CSS runs classes rain or shine and I’ve heard you can learn a lot about traction management by training in rain, but I had no desire to do so! VIR is a great track, technical and loads of fun. The class would be using the North Course, which is 2.25 miles long with a total of 21 turns of all degrees and several considerable grade changes. A wonderful and healthy breakfast was prepared by Keith’s wife and partner Judy. It was eagerly consumed, followed by a sign in where they take an imprint of your charge card (should you have any “mishaps”, you’re responsible for the damages). Next it was time to be fitted with riding gear which consisted of AGV Sport full race leathers, boots, gloves and DOT/SNELL approved helmets, all of which were in excellent condition despite evidence that a few had experienced an “un-intended get off”. We may not have been racers, but we sure looked the part! We were divided into two color coded groups, yellow for our group of levels 1 and 2 and white for levels 3 and 4. (There are four levels of training and everyone starts at level 1, though I bet they wouldn’t make Valentino Rossi start there). This was followed by Keith Code giving the welcome and introductions of the entire staff and their duties. The track manager then gave a review of the flags, their meaning/use and the track rules. Us “newbies” (yellow group) started out in the classroom with an in depth class about cornering by Keith. As it turned out, he taught most of the classroom sessions. Next it was out to the pit area. We first had to perform a simple steering drill, consisting of weaving back and forth over a short distance so they could evaluate our form. You may think you’re doing things correctly, but the coaches don’t miss a thing! Finally it was onto the track itself for our first drill “Throttle Control”. This started us off single file using 4th gear only, with no brakes to get a feel for the amount of engine braking and control available. This also permitted us to get a feel for the track. After the 2nd or 3rd lap we were allowed to pick up the speed. At the beginning of every track session we were instructed to go easy for a lap or two to allow the tires to warm up. Each track session lasted approx. 20-30 minutes. Prior to the class I was concerned about having riders passing and riding next to me and it was a bit un-nerving at first, but this actually became fun as the day progressed. It was almost like being in a mini race. I’m not sure of the actual number, but there may have been 20 bikes total on the track at one time. I admit I got passed a lot, but I was there to learn, not race, though I did some passing too. Speed is relative. You may think you’re riding fast until someone smokes past you. It was common to have a coach pull in front of you and motion for you to follow his/her lead. (You’re doing your best while the coach is glancing back over his/her shoulder at you while cornering. Rather humbling!). They might also motion for you to follow them to a spot safely off the track to discuss any “difficulties” they notice you’re having. As soon as we were off the bike after a track session there was an immediate trackside de-briefing with your coach to discuss that exercise. The ratio of coach to students was very low, with one coach per three or four students. It was like having private lessons. This was the routine with a total of 7 sessions in the classroom and 7 on the track each day. This added up to plenty of track time. After the de-brief it was back into the classroom to talk about “Turn Points”. This time, when we went onto the track the coaches had placed a large X where they wanted us to turn in for a given turn. They were “spoon feeding” us, but the idea was to experience turn points which might be placed at a spot differently than you would normally use. We were allowed to use 3rd & 4th gears, but still no brakes. The first day was Level 1 and included other drills dealing with turning quickly, minimizing negative rider input and their “two-step turn” process, an introduction to Level 2. As the exercises progressed, we were allowed to use more gears and braking. Generally by the end of the day there were no restrictions. It was as fast or slow as you dared to go, but under control. If observed riding unsafely, you could be “black-flagged” and pulled from the track. Once each day the students were called in to ride the “camera bike”. This was one of the bikes that had been rigged with a video cam above and behind your right shoulder. We were instructed to ride one lap at 70-80% after which we took the tape of our lap indoors where it was reviewed with us by one of the coaches. The camera does not lie. It shows, in color, where you’re looking, turning and body position. It’s also possible to determine throttle position by the engine sounds. The next day, another student mentioned he’s using 3rd around the track and 4th with the throttle pinned on the straight. I decided to give it a try. WHOA! Is this the same motorcycle? The ZX6R just turned into a snarling beast of a rocket. The handling changed completely. There was more power available and the bike felt more planted in the corners. How to describe a lap? Accelerate out of the pits, slow, down shift, listen for other bikes approaching. Snap it to the right for turns 1 and 2 that are really one big decreasing right hander, hanging off to the right (a good place to drag a knee) and roll on the throttle to the next turn point. Shift body left for a bend to the left followed by yet a faster left, knee out, engine beginning to snarl. Brake, snap it over for a quick left hook, then fast, shift the body right for the immediately following right hook. Keep body to the right for the slight downgrade into the “snake”, a series of fast “S”s , tuck in the knees, start pouring on the coal, onto a short straight where you pin the throttle, engine starting to scream, for just a few moments to get past that rider in your way. Shift body right, knee out for turn 7, scrub off some speed, turn right quickly and head up an off camber hill rolling on the gas, keep tight on the apex because can’t see the top. Locate that “reference point” to keep from running wide. Two gentle bends, shift body left for fast left then right for the fast right, exiting into two more bends where another rider sneaks by you. “Rollercoaster” coming up, body way right, knee out, brake, snap it tight for the downhill right, relax arms and body for bumps in the pavement, quick, shift body left for the immediately following left. Still headed downhill, accelerating, sweeping left, moving body right for two more sweepers at the bottom, suspension being compressed, stay relaxed, ripples in pavement, don’t want to upset bike. The straightaway is in sight. Twist it up as you straighten the bike up, shift up, pin the throttle. Tuck in tight to the bike because the wind’s trying to rip your head off. Look way ahead not to the sides, stuff going by really fast. Lean for the bend at the start/finish line. I was bushed each evening and was glad to tag along with a couple of guys from North Carolina that first night so I didn’t have to ride my bike somewhere to eat. Besides, the company was enjoyable. An item I found interesting was the number of people in the class or at the track that were present or past aircraft pilots. It was stated to me by one ex-pilot that “it’s as close to flying as you can get without spending a ton of money”. Not one to pass up any opportunity to ride, I rode my BMW K1200LT the 450 miles to VIR. This was perhaps not the best plan since the class was more tiring than I realized. The ride home was not as enjoyable as the ride down because my knees were sore from two days at the track. There is also that chance of injury, however minor, and you’d be in a spot should you ride there. I also noticed on the way home a reduced need to twist the throttle up. It seemed the “Need for Speed” had been quenched, at least for the time being. Was it worth the cost? You bet! It was several weeks before the perpetual smile started to wear off. Any time I reflect on the class a big grin spreads across my face. Did I learn anything that I can use on the street? Most definitely and the classes revealed weaknesses I need to work on. Would I do it again? YES, just as soon as I can put together the fee and fit it into my schedule. I think the 2-day camp was the better approach verses just one day. After a night’s sleep it was as if what they were teaching sank in overnight and the next day it started to “click”. 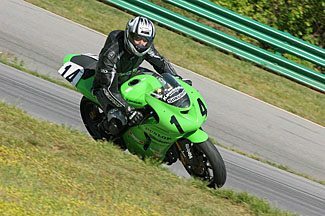 I have never attended a track day, but I am seriously thinking about buying a bike that would be appropriate for that environment. California Superbike School is a first class operation with top notch personnel. Everyone was great and it was obvious they really enjoy what they do, but at the same time are serious about it. They run a tight operation, yet in an un-stressful way. I can’t say enough good things about them. You will come away an improved rider. The two guys I had dinner with do a lot of track days and have taken other track schools, but both agreed they have never received the high level of feedback and input from past coaches as they received from the coaches at California Superbike School.